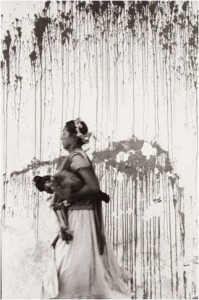 "Los Pollos, Juchitan, Qaxaca" (1979) by Mexican photographer Graciela Itrubide. Luna Negra Dance Theater presents ¡Mujeres! this Saturday, October 1st at the Harris Theater. Mujeres, or woman, is the driving force of an evening showcasing the Latina woman in various forms: a premiere by a female Spanish choreographer about the first queen of pre-modern Spain, a reworking by a Mexican-American female choreographer about a Mexican female painter, and a premiere of a new work inspired by a female Mexican photographer. Touted as “a celebration of globally influential Latinas”, the one-night-only show kicking off Luna’s 2011-2012 season, comes in the middle of Hispanic Heritage Month. Featuring choreography from Artistic Director of Otra Danza, Asun Noales, former Luna dancer and Rehearsal Director of Ballet Hispanico, Michelle Manzanales as well as a world premiere from Luna Negra Artistic Director Gustavo Ramírez Sansano, the seasons opens with a bang! Earlier this month, I sat in on rehearsal for Sansano’s new work inspired by the photograph Los Pollos, Juchitan, Qaxaca (1979) – or The Chickens – by Graciela Iturbide (shown above). The picture captured his attention because it is her only photo in which the subject is blurred, like she’s running or trying to get somewhere. He wanted to know why. In Not Everything, set to music by Arvo Pärt, Sansano recreates the picture and adds context for the mood or actions that happen in the five seconds before she runs. An ambitious goal. “It’s like everything is good, then you get bad information and it goes from your head or brain to your heart and then your gut, then you decide to do something about it,” he explains from their State Street rehearsal studio. “I want it to have the quality of taking you on a trip.” It’s the moment the picture is taken that closes the dance. Add in linoleum set pieces that will be raised to frame the stage with liquid running down in patterns and you literally have art imitating art on the stage. And that’s just the opener. Asun Noales, in her Luna Negra debut, created a full company piece inspired by Juana la Loca (Juana the Mad). The dramatic story of the first queen of pre-modern Spain, danced by Guadalupe, incorporates intense love, grief, richness and madness to a score by Tomás San Miguel. Rounding out the show is a revamped version of Paloma Querida (Beloved Dove), which Luna performed right before Sansano took over directorial control from Eduardo Vilaro. Michelle Manzanales came back to set her piece based on the work of painter Frida Kahlo on the new Luna dancers. The was a huge hit with the audience back in 2010. I’m curious to see it set on a different group of dancers. I’ve been telling pretty much anyone who will listen that they need to go see Luna Negra since Sansano’s debut last fall (his Toda Una Vida was simply stunning). Nothing against the former company, but this group of dancers under his direction is fresh, unique, surprising and super talented. Get your tickets for Saturday’s performance before they are sold out. I promise, it will be worth it. This entry was posted in arts, Ballet Hispanico, contemporary, culture, dance, Gustavo Ramirez Sansano, Harris Theater for Music and Dance, Inspiration, Luna Negra, Michelle Manzanales by Vicki. Bookmark the permalink.